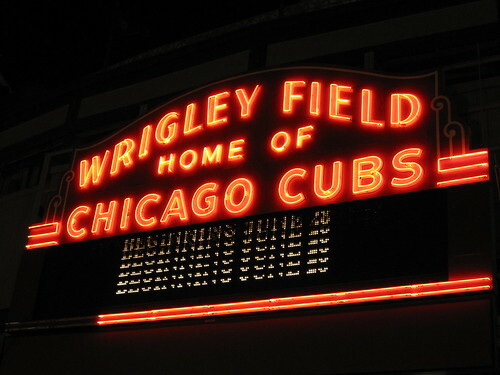 Wrigley Field Neon Sign, a photo by dmatp on Flickr. Yes, I’ll admit it. I’m a Cubs fan. My grandfather worked for the Post Office during the week, but on the weekends when I was young sold concessions at Wrigley Field. I spent many afternoons there when I was young or sitting at home listening to Jack Brickhouse call the games on WGN-TV. Years ago I read the book Home and Away by Scott Simon (of NPR fame). He grew up in Chicago about the same time I was and is a fan’s perspective of the Cubs and other Chicago teams. Every year I listen to this song by Steve Goodman – “A Dying Cub Fans Last Request” – he was battling Leukemia when he wrote it and the last chorus always brings a tear to my eye. Enjoy.